What anxiety chest tightness can feel like? Anxiety caused chest tightness can feel like a tension, pressure, gripping feeling, stabbing pain, muscle tension, burning, numbness, an uneasiness, or a fullness in the chest area (which includes the diaphragm—a sheet of internal muscle that extends across the bottom of the rib cage). This chest tightness may be located in one, a few, or many spots in the chest area, or may move all over the chest area. The chest tightness may radiate to one or both shoulders; into the breasts; into the rib cage; into the sides of the abdomen; into the neck, throat, jaw, and head; and/or can be felt in the back and stomach areas. This chest tightness feeling can also feel worse after eating, and cause a shortness of breath feeling. This chest tightness can occur rarely, frequently, or persistently. It can be experienced as a dull, sharp, stabbing, piercing tightness or pain, and/or as persistent tightness, pressure, fullness, or numbness. This chest tightness may precede, accompany, or follow an escalation of other anxiety sensations and symptoms, or occur by itself. This chest tightness can precede, accompany, or follow an episode of nervousness, anxiety, fear, and elevated stress, or occur ‘out of the blue’ and for no apparent reason. This chest tightness can range in intensity from slight, to moderate, to severe. It can also come in waves, where it’s strong one moment and eases off the next. This chest tightness can change from day to day, and/or from moment to moment. This type of chest tightness is commonly misconstrued as heart problems or the signs of a heart attack. If you are uncertain about your doctor’s diagnosis, however, you may want to seek a second and even third opinion. But if all three opinions concur, you can be assured that stress (including the stress that being overly anxious can cause) is the cause of your sensations and symptom, including this one, and not some other medical or biological problem. 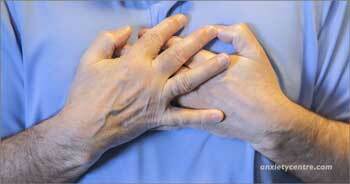 What causes anxiety chest tightness? Behaving anxiously activates the body’s stress response. The stress response causes a number of changes in the body that prepare the body for immediate action when we’re in danger. These changes are commonly referred to as the Stress Response (also known as the Emergency Response or the “flight or fight” response). One of these changes causes muscles in the body to contract and tighten. This tightness is an attempt to protect the body from harm. Because there are many muscles in the chest, stomach, rib cage, neck, and throat areas, these muscles can experience tightness, too. As our anxiety increases, so can these changes and their degrees. The more anxious you are, the more taught these muscles can become. This muscle tightness can lead to pronounced muscle tension and pain, including the muscles in the chest and nearby areas. To make matters worse, many anxious people believe this muscle tightnress may be caused by a heart problem or heart attack, which can cause more stress responses and a further increase in chest tightness and pain, as well as other stress and anxiety related symptoms similar to those of a heart attack, such as profuse sweating, light-headedness, and numbness in the arms, feet or face. These increased symptoms may reinforce your belief that you are having a heart attack, causing even more fear, symptoms, and even panic. Moreover, stomach and digestive symptoms (pain, shooting pain, radiating pain, pressure, fullness, tightness, discomfort) also can be felt in the chest area and may be perceived as heart related, as well. Stomach and digestive symptoms are also common for stress and anxiety, and can emulate chest tightness, pressure, and pain. When you combine all of these factors, it’s plain to see why so many anxious personalities end up in the emergency room each year due to chest tightness symptoms. While anxiety can cause chest tightness symptoms, so can persistently elevated stress, since the stress response is activated by both anxiety and stress. How can I eliminate anxiety chest tightness? When chest tightness is caused by an active stress response (triggered by being anxious, nervous, apprehensive), calming yourself down will bring an end to the stress response. This, in turn, will bring an end to the stress response changes. As your body recovers from the stress response changes, this chest tightness symptom should subside. Keep in mind that it can take up to 20 minutes or more for the body to recover from a major stress response. But this is normal and shouldn’t be a cause for concern. When this symptom is caused by persistently elevated stress, it may take a lot more time for the body to recover and to the point where this symptom subsides. We talk more about this scenario in the Recovery Support area of our website. Nevertheless, when the body has fully recovered from being anxious and stressed, this chest tightness symptom completely disappears. Therefore, the anxiety chest tightness symptom needn’t be a cause for concern. You can speed up the recovery process by reducing your stress, practicing relaxed breathing, increasing your rest and relaxation, and not worrying about this symptom. Again, when your body has recovered from the stress response and/or sustained stress, this symptom will completely disappear. For a more detailed explanation about anxiety chest tightness (and all of the other anxiety symptoms), why symptoms can persist long after the stress response has ended, common barriers to recovery and symptom elimination, and more recovery strategies and tips, we have many chapters that address this information in the Recovery Support area of our website. anxietycentre.com: Information, support, and coaching/counseling/therapy for problematic anxiety and its sensations and symptoms, including the anxiety symptom chest tightness.